Okuma LC40-M “4 Axis Simulturn” CNC Turning Center s/n 6306-1633 w/ Okuma OSP5000L-G Controls, 12-Station Upper Turret, 8-Station Lower Turret, 19 ½” 3-Jaw Power Chuck, Chip Conveyor, Coolant. Okuma LC-20 “4-Axis Simulturn” Twin Turret CNC Turning Center s/n 5903-2305 w/Okuma OSP5000L Controls, 8-Station Upper Turret, 8-Station Lower Turret, 3000 RPM, Hydraulic Tail Stock, 10” 3-Jaw Power Chuck, Chip Conveyor, Coolant. 1994 Methods Machine Tools Methods Slant 50 CNC Turning Center s/n 93070 w/ Yasnac LX3 Controls, 10-Station Turret, Hydraulic Tailstock, 10” 3-Jaw Power Chuck, Coolant. Nakamura-Tome Methods Slant-4 CNC Turning Center s/n C40501 w/ Fanuc System 6T Controls, 10-Station Turret, Hydraulic Tailstock, 2500 RPM, 6 ½” 3-Jaw Chuck, 14” Face Plate, Coolant. Mori Seiki SL-3H CNC Turning Center s/n 4300 w/ Fanuc System 11T Controls, 12-Station Turret, Hydraulic Tailstock, 8” 3-Jaw Power Chuck, Coolant. Vigor FL1840 CNC Lathe w/ Leadjeck Controls, 45-2500 RPM, (2) Tool Posts, Tailstock, 8” 3-Jaw Chuck, Coolant. Mazak Quick Turn-8 CNC Turning Center s/n 6666 w/ Mazatrol CAM T-2 Controls, Tool Presetter, 8-Station Turret, 5C Spindle Nose, Coolant. Kitamura TX80 CNC Turning Center s/n 06325 w/ Fanuc System 10T Controls, 8-Station Turret, Tailstock, 5C Collet Nose, Coolant. Kitamura TX80 CNC Turning Center s/n 06122 w/ Fanuc System 10T Controls, 8-Station Turret, Tailstock, 5C Collet Nose, Coolant. Vigor TC-12G CNC Cross Slide Lathe w/ Fanuc Series 0-TD Controls, 5 ½” x 17” Cross Slide Table, 7” 3-Jaw Chuck, Tooling, Coolant. Vigor TC-12G CNC Cross Slide Lathe w/ Fanuc Series 0-TD Controls, 5 ½” x 17” Cross Slide Table, 7” 3-Jaw Chuck, Tooling, Coolant, (NEEDS ELECTRONIC COMPONENTS). Nakamura-Tome SC-250 CNC Turning Center w/ Fanuc Series 21i-T Controls, 12-Station Turret, Hydraulic Tailstock, (NO CHUCK – NEEDS ELECTRONIC COMPONENTS). Takisawa TC-1 CNC Lathe s/n THZM8511 w/ Fanuc Controls, 12-Station Turret, Tailstock, 3J Collet Nose, Coolant. OmniTurn GT-Jr Series I CNC Cross Slide Lathe s/n 4400PTI w/ OmniTurn Controls, 6” x 14” Cross Slide Table, (2) Pneumatic Accessory Tools, 5C Collet Closer. OmniTurn GT-75 Series II CNC Cross Slide Lathe s/n 2907G35AH w/ OmniTurn Controls, 6” x 14” Cross Slide Table, 5C Spindle, Coolant. OmniTurn GT-75 Series II CNC Cross Slide Lathe s/n 2913G35AH w/ OmniTurn Controls, 6” x 14” Cross Slide Table, 5C Spindle, Coolant. OmniTurn GT-75 Series II CNC Cross Slide Lathe s/n 2554G35P w/ OmniTurn Controls, 6” x 14” Cross Slide Table, 5C Spindle, Coolant. 1992 LeBlond Makino MC86-A40 2-Pallet CNC Horizontal Machining Center s/n A92-385 w/ Fanuc Professional-3 (Fanuc Series 16-MA) Controls, 40-Station ATC, CAT-50 Taper Spindle, 24 ¾” x 24 ¾” Pallets, Coolant. Kitamura MyCenter 1XiF CNC Vertical Machining Center s/n 03327 w/ Fanuc Series 16i-MB Controls, 30-Station ATC, 15,000 RPM, BT-30 Taper Spindle, Coolant. Kitamura MyCenter Zero CNC Vertical Machining Center s/n 01016 w/ Yasnac Controls, 16-Station ATC, BT-30 Taper Spindle, 80-8000 RPM, Travels X=12”, Y=10”, Z=12”, 12.4” x 24” Table, Coolant. YAM MV-3A CNC Vertical Machining Center s/n N67027 w/ Fanuc System 10M Controls, 28-Station ATC, 40-Taper Spindle, 17” x 35 ½” Table, Coolant. Kira APIK KV-5MCS CNC Vertical Machining Center s/n 56048 w/ Fanuc System 6M Controls, 18-Station ATC, 40-Taper Spindle, 5000 RPM, 15 ½” x 35” Table. 2003 Advanced Industrial Technologies Type Slotter mdl. KCM CNC Clotting Machine s/n 3045 w/ Fanuc Series 0i-M Controls, Troyke 4th Axis 9” Rotary Table, (2) Pneumatic Accessory Tools. 1996 Tree Master Journeyman 425 Type J425Z CNC Vertical Mill s/n 01763 w/ Autocon Dynapath Delta CNC Controls, 40-Taper Spindle, Chrome Box Ways, 12” x 51” Table. Bridgeport / EZ Path 2-Axis CNC Vertical Mill w/ EZ Path CNC Controls, Universal Quick-Switch Taper Spindle, Chrome Ways, 9” x 48” Table. Bridgeport Series 1 – 2Hp 3-Axis CNC Vertical Mill s/n V2E3.210 w/ Bridgeport CNC Controls, Universal Quick-Switch Taper Spindle, Chrome Ways, Controlled RPM, 9” x 42” Table. Dyna EM3116 3-Axis CNC Vertical Mill s/n EM31066 w/ Dyna CNC Controls, 50-3750 Dial Change RPM, R8 Spindle, Box Ways, 10” x 50” Table. Bridgeport CNC Vertical Mill (NO CONTROLS) w/ Power Knee, 9” x 42” Table. Kobelco KNW Oil Free Series mdl. KNW 1-G/H 200Hp 2-Stage Rotary Screw Air Compressor s/n 06J0262 / Digital Controls. Kobelco KNW Oil Free Series mdl. KNW 1-G/H 200Hp 2-Stage Rotary Screw Air Compressor s/n 96G0582 w/ Digital Controls. Kobelco KNW Oil Free Series mdl. KNW A1-D/H 150Hp 2-Stage Rotary Screw Air Compressor s/n 00F0238 w/ Digital Controls. 1997 Kaeser DS170 125Hp Rotary Air Compressor s/n 1721007 w/ 620 CFM @ 110 PSIG. (2) Quincy mdl.QSI-370ANA31B 75Hp Rotary Screw Air Compressors s/n’s 65-95686, 65-95687. CompAir Hydrovane 148 30Hp Rotary Vane Air Compressor s/n 000953 w/ Precooler. Gardner Denver mdl. EBEQGF 30Hp Rotary Screw Air Compressor s/n N04789. 1996 Kaeser SK19 15Hp Rotary Air Compressor s/n 01811503 w/ 68 CFM @110 PSIG. 2005 CompressorWorld / Worldair RVK8 Rotary Screw Air Compressor s/n 5291. Carrier Transicold mdl. 5MH120-434 400 PSIG 75Hp High Pressure Compressor. Carrier Transicold 300 PSIG 75Hp High Pressure Compressor. Gardner Denver 20Hp Horizontal Air Compressor. Ingersoll Rand 15Hp Horizontal Air Compressor w/ 3-Stage Pump, 120 Gallon Tank. Campbell Hausfeld 5Hp Vertical Air Compressor w/ 60 Gallon Tank. Zeks mdl. 500HSFA400 Refrigerated Air Dryer s/n 313843. Kaeser KRD075 Refrigerated Air Dryer / 120 Gallon Air Storage Tank Combo. Ingersoll Rand mdl. D6801NA400 Refrigerated Air Dryer s/n 348015. Pneumatech mdl. EH-100 Heatless Regenerative Air Dryer. 120 Gallon and 80 Gallon Air Storage Tanks. Cincinnati mdl. 1412 3/16” x 12’ Power Shear s/n 38623 w/ Auto-Shear Controlled Bach Gage, Squaring Arm and Front Supports. Niagara No.410 14GA x 10’ Power Shear s/n 48920 w/ Squaring Arm, Front Supports (NEEDS BACK GAGE REPAIR). Cincinnati mdl. 1408 3/16” x 8’ Power Shear s/n 18831 w/ Controlled Back Gage, Squaring Arm. Newtons 80” Power Shear w/ Manual Back Gage. Niagara No.26 16GA x 6’ Power Shear s/n 39207.Area. Minster No.7 75 Ton OBI Stamping Press s/n 7-8586 w/ Pneumatic Clutch, 3 ½” Stroke, 3 ¼” Slide Adj., 22” x 36” Bolster Area. (2) Walsh No.65 OBI Stamping Presses s/n’s 10343and 9098 w/ Pneumatic Clutch, 18” x 32” Bolster Area. 2010 Kent KGS1020SD 10” x 20” CNC Surface Grinder s/n KT102085 w/ Siemens Simatic Panel Touch Controls, 10” x 20” Fine-Line Electromagnetic Chuck, Coolant. Okamoto Accugr-124N 12” x 24” Auto Surface Grinder s/n 6776 w/ Okamoto Controls, 12” x 24” Electromagnetic Chuck. Landis Centerless Grinder w/ Wheel Dresser. Engolberg 9” Wet-Belt Sander w/ 11 ¼” x 24 ½” Pneumatic Cross Slide Table. Deckel SO Single Lip Tool Grinder s/n SO/60-2404 w/Cabinet Base. Thompson mdl. B 12” x 40” Auto Surface Grinder w/ Electromagnetic Chuck, Coolant. Reid 6” x 18” Auto Surface Grinder w/ Electromagnetic Chuck. King 52” Vertical Turret Lathe s/n 2255 w/ 2.25-72.1 RPM, 5-Station Turret Head with +-25 Degrees Tilt, Boring Head with +-50 Degrees Tilt, Facing / Turning Head. J & L No. 10A Large Bore Turret Lathe s/n 70336 w/ 10 ½” Thru Spindle Bore, 8-400 RPM, 6-Station Turret, Taper Attachment, Cross Slide, 21” 3-Jaw Chuck, 24” 3-Jaw Chuck. Okuma Type LS 18” x 52” Lathe w/ 35-1800 RPM, Inch Threading, Taper Attachment, Tailstock, 10” 3-Jaw Chuck, Kirkelie Tool Post. 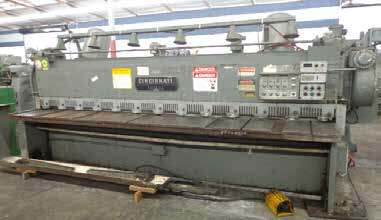 Cincinnati 18” x 42” “Tray Top” Lathe s/n HT841 w/ 20-820 RPM, Inch Threading, Tailstock, 14” 4-Jaw and 12” 3-Jaw Chucks. Crown “Crown-2” 17” x 42” Geared Head Gap Bed Lathe s/n C20026 w/ 32-2000 RPM, Inch/mm Threading, Tailstock, Trava-Dial, KDK Tool Post, 8” 3-Jaw Chuck. Clark 14” x 40” Geared Head Gap Bed Lathe s/n 80433 w/ Contour SDS2L DRO, 40-1800 RPM, Inch Threading, Tailstock, Steady Rest, Aloris Tool Post, 8” 3-Jaw Chuck, Coolant. Ramco 15” x 32” Geared Head Lathe w/ 45-2000 RPM, Inch/mm Threading, Tailstock, 5C Collet Closer, 10” 4-Jaw Chuck. Hardinge DSM-59 Tool Room Lathe s/n DV-59-11592 w/ 125-3000 RPM, 5C Collet Closer, Cross Slide, 6-Station Turret, Coolant. Hardinge HSL Speed Lathe w/ Cross Slide, 5C Collet Closer.